Welcome to the website of the Global Maternal Newborn Health Conference 2015! Researchers, policymakers, funders, implementers, and other stakeholders gathered in Mexico City, Mexico from 18 – 21 October 2015 to share new evidence, identify opportunities and gaps, build understanding across disciplinary boundaries, and discuss the way forward to improve maternal and newborn health around the globe. The Global Maternal Newborn Health Conference 2015 (GMNHC2015) was organized by the Maternal Health Task Force at the Harvard T. H. Chan School of Public Health, USAID’s flagship Maternal and Child Survival Program, and Saving Newborn Lives at Save the Children, in collaboration with convening partners. On April 12-13, 2016, The Maternal Health Task Force co-hosted two policy dialogues at the Wilson Center in Washington, D.C. Find event recaps and the webcasts below! Following GMNHC2015, the conference co-chairs published a commentary blog with the Public Library of Science titled The Global Development Framework in Transition: Where are Mothers and Newborns in the Post-2015 Era?. 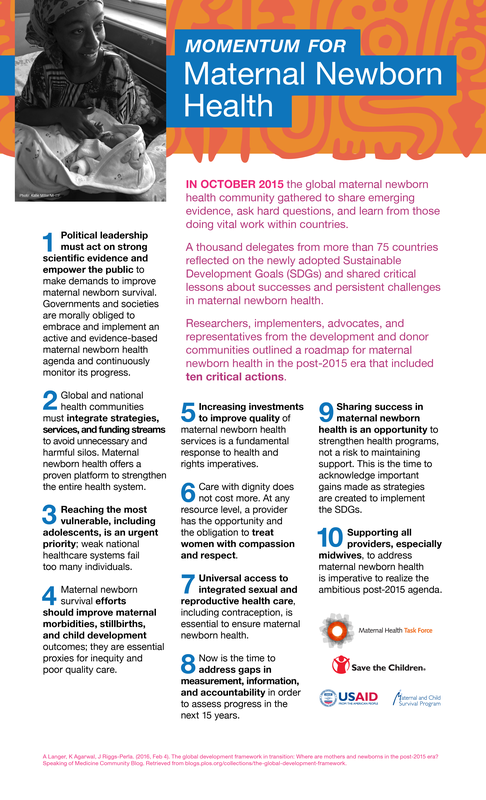 The commentary outlines ten critical actions for maternal newborn health, featured in this poster. For the full GMNHC2015 program, including links to presentations made at the conference, visit the conference program page. Videos recorded at GMNHC2015 are being added to the site daily. The conference videos page has a full list of videos available for streaming and download. A highlights reel from the conference can be found here. For highlights from the conference including blogs, articles, and social media discussions, check out the GMNHC2015 coverage archive. To see the official photos taken during GMNHC2015, please visit the conference photos page. For a schedule of the auxiliary sessions that were hosted in concert with GMNHC2015, check out the auxiliary session page.